Let's be honest, I am so behind that it no longer makes sense to try and do posts in order. So here's something from last Friday, when we were on our way to G&H's wedding in Manchester. Since we were driving, we decided to spend a night in Buxton so that we wouldn't have to get up quite as early on Saturday to make it to the party. Buxton is small - with a great park, opera house, and other villagey charms. For the size of the place, there are an awful lot of drinking spots - but we settled on the Buxton Tap House due to their large selection of beers that they produce themselves. For those of you curious about the beers, follow A on Untapped - I'm just going to cover the food. We had the night's special of smoked salmon (smoked on site, which you could certainly taste! 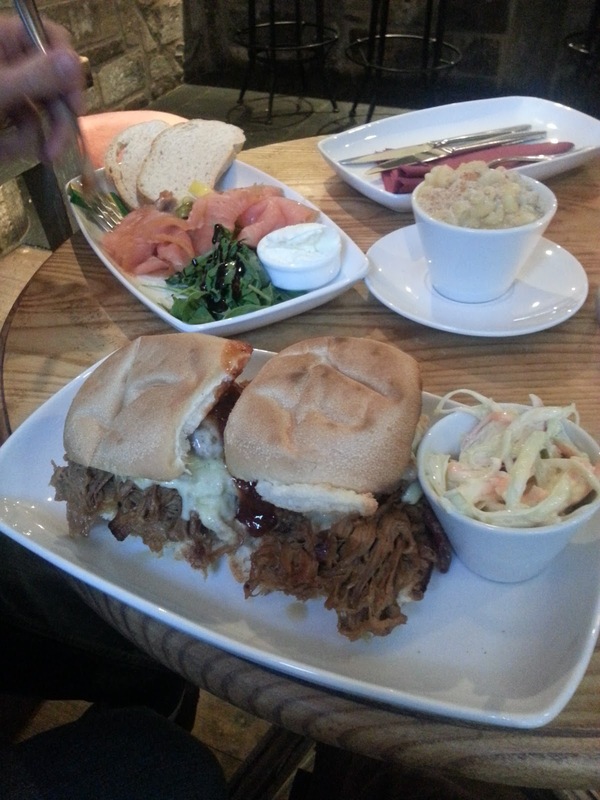 ), along with a couple of "sliders" which were more like full sized sandwiches - stuffed to the brim with pulled pork, bacon, sausage and cheese. That was actually overkill - I picked out the bacon and sausage and had that with the top half of the roll, then got through the generous and tender pile of pulled pork. We also had the mac and cheese, which I would skip - it's not bad but it's not worth the calories either. Not a bad option for some dinner with your interesting beers - wish we had more time to explore Buxton properly but oh well.